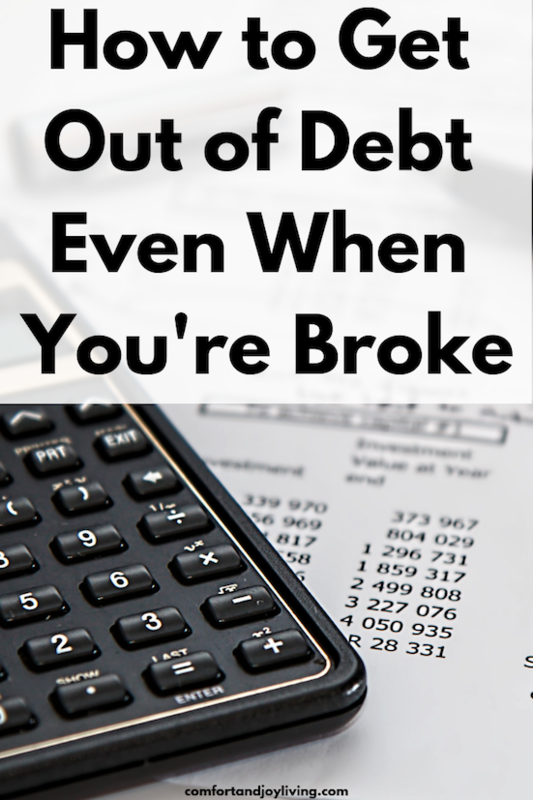 Wondering how you can get out of debt? Being in debt is one of the worst situations that you can be in. It can take a toll on a person’s life with sleepless nights, strained relationships and being stressed all the time. You may feel helpless and constantly trying to figure out how to get out of debt, it never leaves your mind. This is no way to live your life. To be honest, you aren’t really living a life at all, you’re just trying to survive debt. I know this because I have been in the same boat that you’re in now. Always trying to figure out how I can get out of debt and thinking that it seemed impossible. Even though it may seem like you will be in debt forever, it really doesn’t have to be this way. You need to be proactive in paying off the debt. It’s not an easy road, but it can be done. Here is the thing, you need to want it bad enough, and if you do, then you need to make a commitment right now. You have to be all in because getting out of debt can be one of the hardest things that you will ever do. With that being said, you absolutely can get out of debt with enough discipline, a commitment, a plan and a lot of hard work. And trust me, once you are free of debt, you will have a new lease on life. The first thing that you need to work on is changing your attitude about money. After all, your behavior towards money is the reason that you’re in debt in the first place. You have to change your mindset from being a spender to a saver. Changing your money mindset is the first step in getting out of debt. Let me ask you, how often do you tell yourself “It’s only 20 dollars, it’s not going to make much of a difference” or “Oh well, out cable went up again, but there’s nothing that I can do about it.”? If you’ve ever though about money in this way, then you need to change how you perceive the value of money. Guess what? Saying “It’s only 20 dollars” once a week adds up to $1040 a year. No, money isn’t everything, but right now, it’s stopping you from living your best life. Until you’re debt free, you need to treat it as if it’s everything to you…because it is. It’s preventing you from being happy and living the dream. You need to be all in to get out of debt. Now that you know what’s at stake, I’m sure that you’re all in, right? What I mean by this is that you are ready and willing to do whatever you need to do (legally, of course) to get yourself out of debt. This means that everything that you do from now until you are debt free is geared toward paying off your debt. You have to stop wondering how to get out of debt and start taking actin. Every single penny that you can save or earn needs to go towards paying down your debt. You need to focus on being proactive in paying off debt, come up with an action plan, finding ways to save money, stick to a budget, and looking for ways to bring in some extra income. Once you have changed your attitude towards money and have set your mind to do whatever you need to do to get rid of debt, controlling your spending should become much easier. Maybe you spend more money than you should because you get bored or you put yourself in situations that you really should stay away from. There may be many reasons why you overspend and aren’t living below your means. Identify what triggers you to spend money when you know you really can’t afford to. Find something to replace shopping and spending when these situations arise. Do you go shopping when you’re bored? Find a hobby to replace shopping, or better yet, take on a side hustle which will help you stop spending and allow you to earn money to pay down debt at the same time. Maybe you and your friends always hit up the mall on the weekends for fun. Replace this activity with a cheaper alternative. If money is burning a hole in your pocket and you know that you can’t control your spending if you have it with you, then leave your cash and cards at home and bring only enough to cover planned purchases. It’s important to have an emergency savings account, even more so when you’re trying to get out of debt. You know as well as I do that unexpected expenses happen all the time. And if you’re not prepared for them, they will cause you to get into more debt than you are in now. I know that many people want t make a plan on how to get out of debt, jump right in and try to get rid of it as fast as possible. This is a good thing, but only after you have a decent emergency fund set up. If an emergency situation arises and you don’t have emergency savings to fall back on, you will end up deeper in debt. I’m sure that if you thought about it, you could remember a number of times that you used a credit card as your backup when something unexpected came up. I probably don’t have to tell you this, but credit card debt is the worst kind of debt. The first step is to set up a savings account at a bank other than the one that you do your normal everyday business with. One that you can’t instantly transfer money into your checking account with a simple click of the mouse on your online banking site or hit up the ATM anytime that you’re short on cash and need of few bucks. This account is only for emergencies and grabbing a few bucks to make a Starbucks run doesn’t qualify as an emergency. Don’t worry about not being able to access your money instantly. Typically, you can get your money transferred to your regular bank within one business day if you need it. This will prevent you from dipping into your emergency fund when you want to spend money on a whim, yet you will still be able to get it in time to pay for that “real” reason when you may need it. Once you’ve opened this account, it’s time to place savings in it. I suggest that your first goal is to get that account up to $1,000 before concentration on paying off debt. Once you’re out of debt, try to get your emergency fun to at least 3-6 months’ worth of living expenses. Now that you’ve cut back on spending, and have an emergency fund, you need to create a budget to stay on track with your debt repayment plan. There’s no way out of this. Many people don’t like the idea of a budget, but it’s essential to stay on track while paying off debt. It can be difficult to stick to a budget at first, but believe me, it does get easier. Before you know it, it will become second nature. Your budget will become your best friend in helping to keep track with your spending while you’re working to get out of debt fast. The keys to creating a budget that you can live with are to make sure that you include everything needed so that you don’t fail when something arises that you forgot to budget for such as yearly bills that you don’t really think about until they’re due. You also need to give yourself some wiggle room in your budget. It can be tempting to try to squeeze every single penny out of your budget when you are determined to get out of debt. Although this may seem like the right way to get out of debt faster, this is a mistake and cause you to fail at your budget and may even give up. Instead, you should plan for the unexpected because you know that little expenses arise all the time. This way, you won’t feel like you’ve failed at budgeting because you’ve given yourself some padding. Plus, if you don’t end up needing the money, or have some to spare at the end of the month, you can put that towards paying down your debt. Next, you need to face the music and calculate exactly how much debt you’re in. You will never be able to get out of debt by ignoring it. I know that it can be scary, but it has to be done. Grab all of your credit card and all other bills and calculate the total amount due. List each bill on a piece of paper. Next to each, write down the total balance and the interest rate that you are being charged. While you review your credit card bills, have you noticed how much of your monthly payments are going towards paying interest? This is money that you’re basically flushing down the toilet because of your debt. Let’s put this into perspective. Take for example a $500 car repair bill, if you put that on a credit card and only make the minimum payments, you’ll probably end up paying close to $1,000 in principal and interest when all is said and done. Yes, you’ll pay almost double the original amount by using credit recklessly. This is something that you really need to think about before whipping out your credit card. On one of my credit card bills, I had a balance of a little below $3,000 with a minimum payment of $70. On the back of the bill, it stated that by paying only the minimum payment every month, it would take 14 years to pay off. YIKES…Not only that, I would end up paying over $6,000 in the end. That’s 50% more in interest alone. It also stated that if I paid $108 per month instead of the $70 minimum payment, it would cut the repayment of this debt down to 3 years instead of 14 years. So, by paying about 54% more, just $38 per month more on this card, I would finish paying it off 11 years faster. I’m pretty surer that if you knew a misly $38 a month could help pay off a debt 11 years sooner, you would be able to find it in your budget. Right? Two of the most common ways to pay down debt are the “Debt Avalanche” method and the “Debt Snowball” method. The Debt Stacking method is done by attacking the debt with the highest interest first. Once that’s paid, you stack the amount to the minimum payment that you are making on the next highest interest debt and so on until you’re debt free. The Debt Snowball method is where you pay the debt with the lowest balance first. One that’s paid, you snowball the amount you were paying into the minimum payment on the next lowest balance debt and so on. Personally, I prefer the Debt Snowball method, although the Debt Stacking method will save you some money on interest. In the long run, you will see faster result with the Debt Snowball method. Seeing the results of having one debt paid off is so encouraging and will help keep it going. It’s your choice which method you use. You just need to choose one and stick with it no matter what and soon you will start to see the light at the end of the tunnel. Anyone who’s serious about figuring out how to pay off their debt wants to get it done and over with as soon as possible. That’s the goal, right? The thing is that you have to set realistic and achievable goals. It’s not realistic to set a goal to get out of $50,000 of debt in one year when you earn $30,000 a year. Not that this can’t be done. But it would require you to increase your increase your income considerably with a side hustle and drastically reduce your expenses. As you start earning more and reducing your expenses, you can adjust your goal at that time. Setting smaller, more manageable goals is a good way to go about it. So, instead of committing to pay off $10,000 of debt this year, set a goal to pay off $800 of your debt every month or $200 a week. Every week or month that your reach your goal is one step closer to getting out of debt. It is more encouraging because you’re achieving smaller wins that will lead you to your ultimate goal of becoming debt free. Debt consolidation can be a good option to get some help to get out of debt. By consolidating your debt, you’re able to reduce the amount of interest that you’re paying. This will shorten the time that it takes you to pay it off. It also helps you manage your debt payments much easier. You make one monthly payment on your consolidated debt. This is much easier than juggling ten payments a month to ten different companies. It will also allow you more time to concentrate on earning extra income and reducing your expenses. Negotiating better interest rates is another way to help you get out of debt. It’s not as scary to do as it sounds and it can save you a lot of money. Simply call your creditors and let them know that you think that the interest that you’re paying on your credit card is higher than you would like it to be. It can help to let them know that you’ve found better rates, but you would rather continue doing business with them. Many times, this simple phone call will do the trick. If a company refuses, the first thing that you should do is speak to a manager or supervisor to see if they can help you since they have more authority to do these things. If they still refuse, ask why. It could be that your credit score is a mess and they know that you won’t be able to transfer your balance. If this is the case, you can try again once you improve your credit score. Now that you know what you’re facing, created a budget, developed a plan of action and set realistic and achievable goals, now it’s time to reduce your expenses. Take a good hard look at your budget and everything that you currently spend money on every month. Cut out as much non-essential spending that you can. Next, find ways to cut out unnecessary expenses. Get rid of anything that isn’t essential. This can be gym memberships, subscriptions to magazines, music streaming services and other things like this. You know that there will be some things that you think you can’t live without. Think of ways that you can still save money while you’re not feeling too deprived. Substituting some things for less expensive versions can be a great way to save money to pay down debt. You’re still getting what you “think” that you can’t live without. Think in terms of making your own specialty coffee at home instead of splurging on costly Starbucks coffee. How about getting a digital TV antenna or Netflix to cut out cable. Why not look for a less expensive cell phone plan to save on this costly expense. Look for ways to reduce the amount of money that you pay for your needs as well. Find ways to save on your energy bills or see if you can refinance your mortgage with a lower interest rate. Earning extra income will allow you to expedite your debt free journey into high gear and pay off debt faster. There a many things that you can do to earn some extra cash to pay down your debt. You can work overtime, start a side hustle, and find ways to earn passive income to bring in more money. Think outside the box. You can get a second job, have a garage sale, complete online surveys in your spare time, babysit, sell your stuff, rent out a room, mow lawns, clean houses, run errands for elderly neighbors or walk dogs. I can go on and one, there are endless ways to bring in an extra income. Lastly, any time that you come across any found or unexpected cash, make sure to pay down your debt with it. By found money, I mean cash gifts, work bonuses, income tax returns and any other cash that you might receive. I know its nice to be able to treat yourself with found money, but in the end, it’ll help you get out of debt much sooner. Once your debt is paid, you can treat yourself. But or now, getting out o debt is the reward that you should be focusing on. Now that you know how to become debt free, never give up on the fight. It’s a lot of work, but it definitely pays off in the end. Just keep at it and do whatever it takes. Believe me, you will be so much happier once you are free of debt.